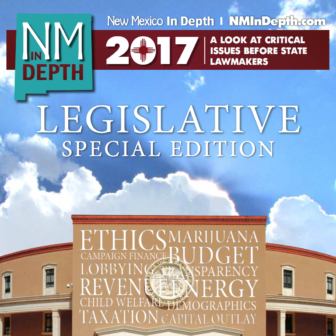 The 2018 New Mexico In Depth Special Edition focused on New Mexico’s state legislative session will include stories that set the stage for our reporting during the session on a range of issues, including child welfare and education, criminal justice reform, government transparency, the influence of money in politics and lawmaking, and the nexus of taxation and economy. Your sponsorship provides crucial support for our statehouse reporting, and we’ll acknowledge your contribution with specially designed artwork at the corresponding size in our special edition. We’ll acknowledge your sponsorship in NMID articles sent to our email list and posted on NMID’s Facebook page. Go a step further with tailored sponsorship packages that include messages within NMID boosted Facebook posts and prominent placement on our website. Click here to become a sponsor today. $250: Special thank you with logo on our acknowledgement page. $2000: Prominent sponsorship recognition in the right sidebar of all NMID news articles (boosted and non-boosted) during the session.